The U.S. — and North America as a whole — is becoming more and more dependent on the Middle East for a crucial resource. An argument can be made that this resource is even more valuable than oil... because without it, mankind can't feed itself. I'm talking about phosphate — the component in fertilizer essential for root and stem development in plants, and for which there is no agricultural substitute. Some 200 million metric tonnes are produced annually worldwide. Just about 70% of that comes from the Middle East and Northern Africa. For contrast, only about 40-50% of the world's oil comes from those regions. About 7% goes toward animal food. And the rest is used in various food and sundry industries like preservatives, cosmetics, soaps, and fungicides. Now, not all phosphate makes it to market. Of the 200 million tonnes produced annually, 85% is integrated with downstream production. By that, I mean a major company like the $25 billion Potash Corp. (NYSE: POT) will use the phosphate it produces to make final products. 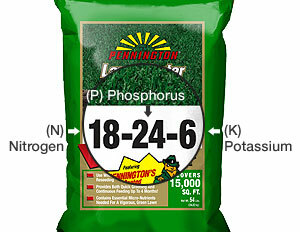 Potash, for example, sells a dozen phosphate-based finished fertilizer products, and several more in the animal feed and industrial use spaces. So only about 15%, or 30 million tonnes, of the 200 million produced annually make it to market. They are all dependent on the Middle East and North Africa for that supply, especially Morocco, Syria, Egypt, Israel, Jordan, Tunisia, and Algeria. There aren't too many friendly or stable names on that list. Again, I'd argue the situation is worse than with oil. With so much supply coming from unstable places, rising population, and emerging markets requiring higher quality food and proteins (a chicken is corn with feathers on it, after all), demand for phosphate as well as prices are in an upward trajectory. 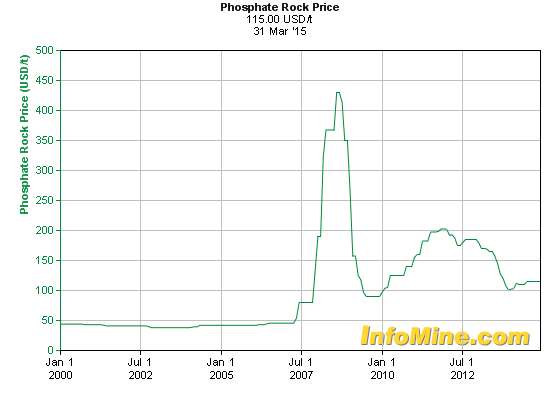 Phosphate rock demand grows at 2-3% (4-6 Mt/y) per year. Phosphate rock can come from two types of geologic deposits: Sedimentary or Igneous. Sedimentary rocks are formed by the deposition of material at the Earth's surface and within bodies of water. Before being deposited, sediment was formed by weathering and erosion in a source area, and then transported to the place of deposition by water, wind, ice, mass movement, or glaciers. These are called agents of denudation. Igneous rock is formed through the cooling and solidification of magma or lava. Over 90% of global phosphate comes from sedimentary rock. Less than 10% comes from igneous rock. These are not equal in quality. Sedimentary rocks contain higher-grade ore. 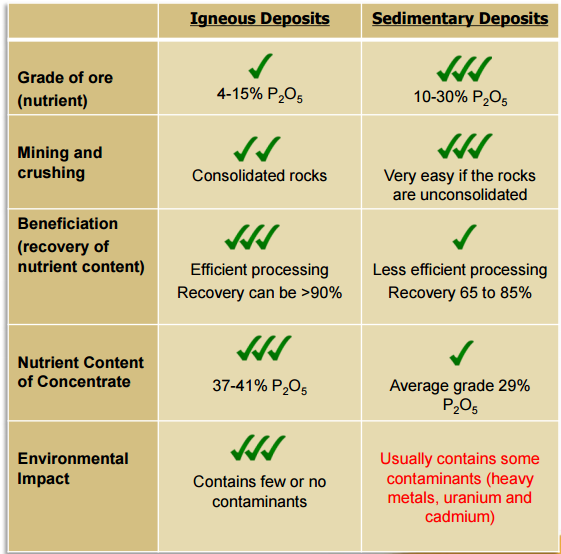 But recoveries and the final concentration of Phosphorous Pentoxide (P2O5) are higher with igneous ore. The most important distinction between the two is the presence of contaminates. Because of the way many sedimentary deposits are formed, they contain trace amounts of heavy metals, uranium, and cadmium. As such, many phosphates derived from sedimentary rocks are not ideally suited to be used in food industries. If I had a giant phosphate deposit, I'd want it to be igneous. 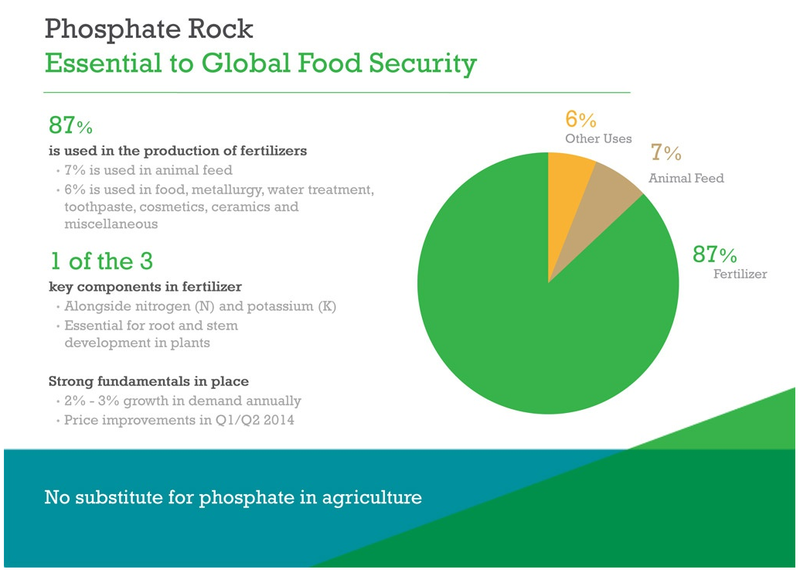 The world needs tonnes of phosphate — some 200 million per year and growing. Most of this (70%) comes from the Middle East. It's a critical element in food production as fertilizer, but also in many other industries. Production in Tunisia is down from 8 Mt/y to 2.5 Mt/y since the Arab Spring. Russia exports the highest grade (39%) rock, but is under economic sanctions. Syria's civil war has led to a 58% drop in production from 2012 to 2013, and is likely not producing any at the present time. U.S. phosphate production is expected to decrease by more than 25 Mt/y in the next 15 years. It currently produces around 30 Mt/y and consumes it all. The U.S. is also the world's leading importer of phosphate rock. 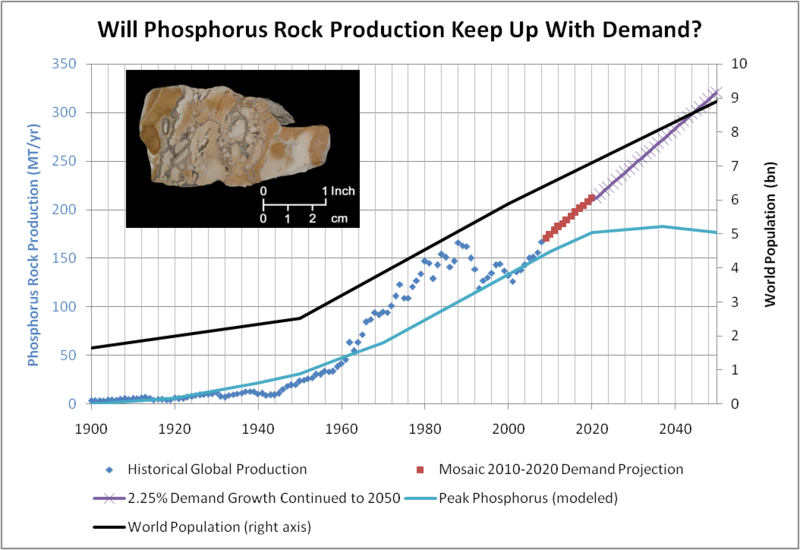 Where will the quality phosphate rock of the future come from? And how can we profit from it? In that list just above of where new mine supply is going to come from, I omitted Canada. It would fall just above Russia and just below China with 3 million tonnes of new supply expected to come online annually by 2023. That will likely all be produced by one company: Arianne Phosphate. In fact, in the most recent USGS Minerals Yearbook available, 2012, it cites Canada generally and Arianne specifically as potential new sources of phosphate for the world. 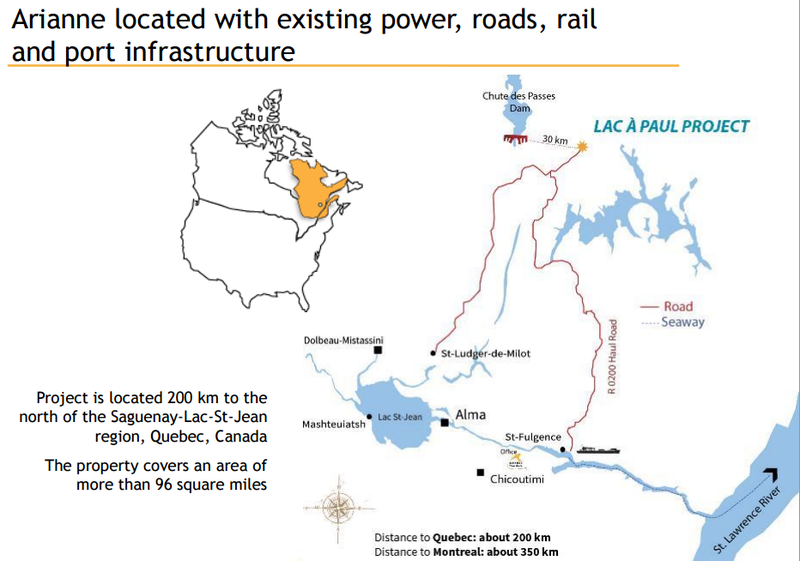 Canada.—Arianne Phosphate Inc. continued development of the Lac à Paul Project in Northern Quebec. An enhanced prefeasibility study was completed in May 2012 that showed measured and indicated resources of 348 Mt of apatite with an average grade of 6.5% P2 O5 that could be upgraded to a 38% P2 O5 . 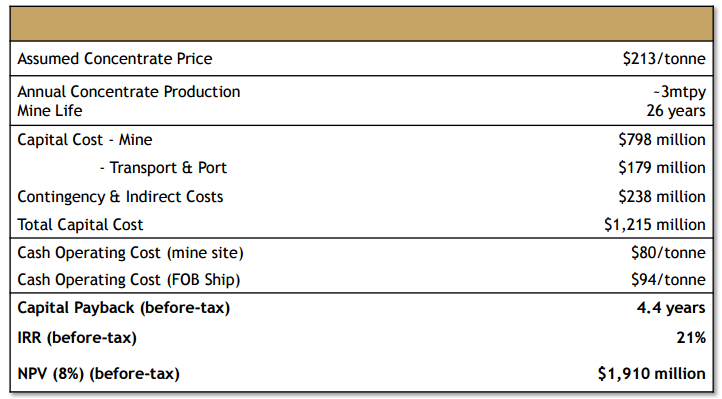 Arianne expected production to average 3 Mt/yr of concentrate for 17 years of projected mine life. The company expected a feasibility study to be completed in 2013 and mining to begin in 2016 (Arianne Phosphate Inc., 2012). The only other countries to get a nod in the Yearbook were Australia, Namibia, Russia, and Saudi Arabia. 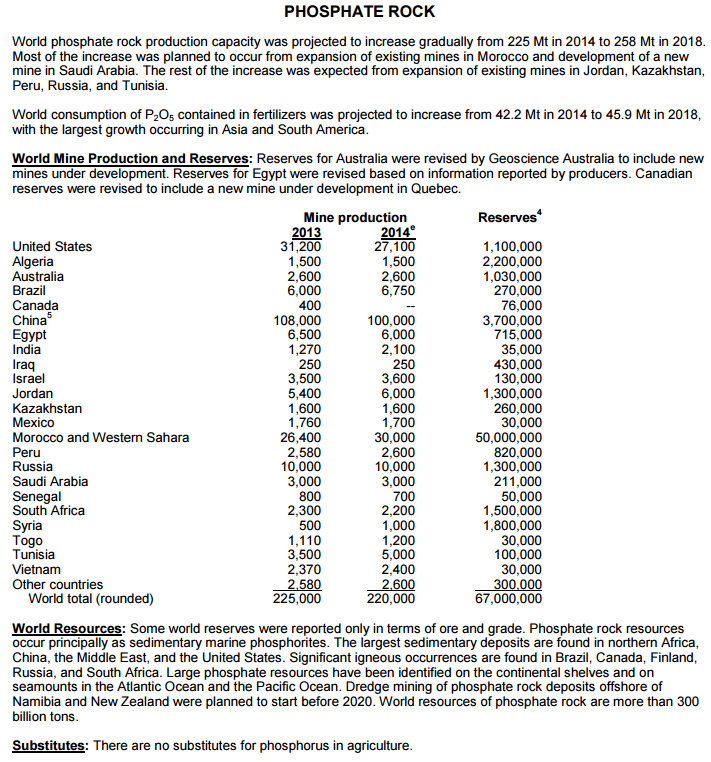 More recently, in its 2015 Mineral Commodity Summary for Phosphate Rock, Canada made the list of countries with top reserves and even got a special mention for the fact that it's igneous in nature. The new mine under development it refers to is Arianne's Lac a Paul project in Quebec. This is an absolutely mammoth project located in Quebec, Canada. It covers over 96 square miles, or 61,440 acres. More important than the land size, though, is just how much phosphate it contains. A national instrument 43-101 shows proven and probably reserves of 472 million tons of ore grading 6.9% P2O5. A 2013 Feasibility Study showed the mine producing 3 million tonnes per year for 26 years in a low-cost, open-pit using conventional truck and shovel, crushing, grinding, and floating with 90% recoveries. That comes with a 4.4-year payback, a 21% internal rate of return pre-tax, and a net present value of $1.9 billion. In other words, with a share price of C$0.85 and 111 million shares fully diluted, Arianne Phosphate is trading at a value of C$94.35 million — or just 5% of the intrinsic value of the phosphate asset it controls. Remember the prior discussion about how phosphate from igneous rock is better than phosphate from sedimentary rock? Igneous produces higher purity concentrates of P2O5, which is the main phosphorous ingredient used in fertilizer. And it does this with a lower cost than sedimentary phosphate because of higher recovery rates and easier extraction that uses less sulphuric acid than traditional methods. That's a 38% savings in finished product. Well, you've seen the economics. They're robust and speak for themselves. But Arianne has a few more things going for it as well. For starters, there is already infrastructure for the project in the form of a power dam and access roads that lead to open sea ports. There is also additional exploration upside. Drilling has already shown the potential for the Paul Zone to add an additional 260-390 Mt of reserves. There are also 78 Mt inferred at the Nicole Zone, 17 Mt at the Traverse Zone, 146 Mt at the TraMan Zone, and 64 Mt at Zone 2. These increased reserves allow operating costs to be reduced since mine life would be extended and the initial CAPEX can be amortized over a longer mine life. The Feasibility Study shows a 26-year mine life. Arianne is working, successfully, to upgrade that to 50 years. A power deal with Hydro-Quebec allows for long-term discounted electricity rates, which also lowers costs. There is also the possibility of using mining equipment and trucks with LNG engines to further reduce costs. All this contributes to increased net present value, profitability, and decreased payback period. 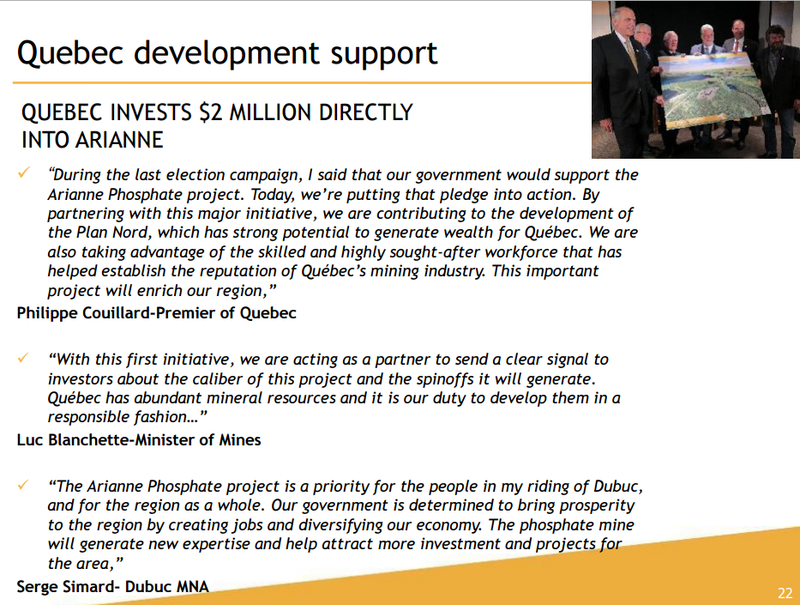 What's more, the government and leaders of Quebec fully support the project, and have even invested $2 million directly into Arianne Phosphate. Let me say up front that it's my opinion this project will be acquired by a major phosphate miner like Potash, Agrium, Mosaic, or possibly even an international player like Israel Chemical, which recently said it wants to double its specialty phosphate chemical business. With a deposit of this size and quality, it only makes sense for a big player like that to be looking into acquiring it. It just makes sense for those giants to be vertically integrated, meaning they own the upstream phosphate sources of their downstream products. With few other targets in safe jurisdictions with great economics, Arianne looks like a prime target. The company already has the support of the First Nations, which is critical in Canada. A cooperation agreement was signed between Arianne and three Innu First Nations in June 2015. Full permitting is expected in late 2015, and is expected to go according to plan. Then all that remains in de-risking this quality project is officially reducing the OpEx and CapEx, and putting forth an optimized transportation plan to get its product to market. The only real risk is securing the nearly billion dollars in CapEx this mine needs to get going. But given it's expected to generate $700 million per year in revenue with EBITDA of $300 million, and a payback of just 4.4 years... it shouldn't be hard to find an offtake partner or outright suitor. Phosphate and related fertilizer peers are generally valued at 4-5.5x revenue, or 7-12x EBITDA. Because this is such an early-stage play, let's cut those in half to remain conservative. Arianne's Lac a Paul mine is expected to generate revenues of $700 million per year and EBITDA of $300 million per year. At 2x revenue it would be a $1.4 billion company. That would make it a $12 stock. At 3.5x EBITDA it would be a $1.05 billion company. That would make it a $9.50 stock. It currently trades around C$1.00.